The present issue continues a tradition of publishing articles based on papers given at bilateral Russo-Vatican conferences. 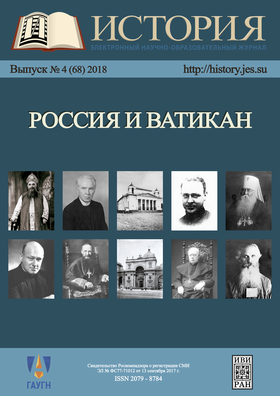 The “Russia and the Vatican in the international context during Pius XI’ (1922—1939) pontificate” conference, the materials of which are published in this issue, was originally held in May 2014 at the Herzen Russian State Pedagogical University in Saint-Petersburg. The main goal set by participants was to outline preliminary results of recent studies in the Vatican’s foreign policy and the relations between the Holy See and Russia in the 1920s and 1930s, both in the light of primary sources explored up to date and of secondary literature.